New Riders Publishing, 9780321733009, 139pp. The secret to creative success lies not in knowing the right answers, but in knowing how to ask the right questions-and this little book is full of them A veritable therapy session on paper, 344 Questions is composed entirely of questions designed to help you determine where you are in your life and career, where you want to be, and how to get there. Hopefully, you'll also laugh along the way. 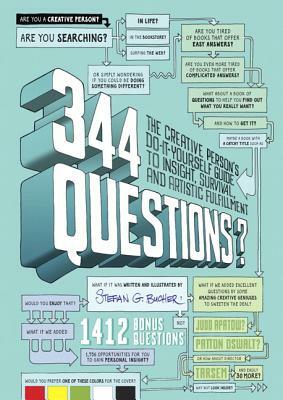 Each spread in this colorful, pocket-sized book contains a series of several questions illustrated in Stefan Bucher's unique, whimsical, hand-lettered style. The questions are designed to get you thinking and drawing and writing with room on each spread to fill in the blanks and jot down ideas. Sample questions include: Can you name 10 things that reliably stress you out? Do you need 10 more spaces? Was filling out lists on your list? Or the decimal system? What happens when you get stressed out? Do you think stress is heroic? Can you please convince me that that's really stupid? If you answer even half of the questions in this book, it will change your life.